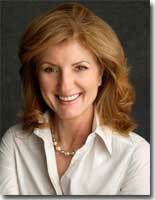 Huffington is talking about Huffington Post's plan to work with Jay Rosen's new project. NewAssignment.net, in covering the 2006 presidential campaign. We'll have a citizen journalists in every state, she says. What's a citizen journalists, asks Diller. Mossberg, not missing a beat, jumps in: "It's like citizen surgey." Rim shot. Big laugh from the newspaper editors. Huffington diagnoses web publishers with obsessive compulsive disorder -- hammering a topic either to death or until it mainstream media notice. By comparison, she says, print suffers from attention deficit disorder: "How many stories die on the front page of the paper?" True. The press often moves on before the public is ready to let go. Diller childes newspapers for repurposing content from print to the web. Doesn't work, he says. The future of online news -- and of the web in general, he says -- is original content, "internet created, not replicated." The tools are here now -- audio, video, graphics and, yes, text. "Use the tools of the Internet in every way you can," he says, "for journalism and all the other things that are in the paper" that are headed for the web. Mossberg says he's doing low-tech videos to go with his columns. No production values, he says, no editing, but a recent one gets 60,000 plays. He's astonished, but Diller's not. "You are the production value, he tells Mossberg. His point: Name matters, content matters, brand matters. Everything else is frosting. UPDATE: Good stuff on the panel from Rachel Sklar. "The press often moves on before the public is ready to let go." So true! I need to (gently) push my editor to let me do more follow up stories.